Thanks to its modular design, the OptiSorter packet and parcel sorter can be flexibly configured to suit individual customer requirements and it can also be fitted with a large number of attractive additional capabilities: For example, industry leading BÖWE Sort OCR reading technology offers omnidirectional OCR and barcode reading and guarantees the highest reading levels for both handwriting and typewriting. The numerous configuration options not only allow every operational and spatial conditions to be satisfied, but also ensure the ability to react flexibly to changes in the market. This flexibility extends to the software: BÖWE Sort control software allows tailored solutions to be configured that can both independently model every process but which can also integrate existing systems. 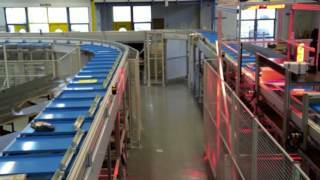 The horizontal OptiSorter’s sorting technology provides high-speed sorting. Whether it be brochures, catalogues or poly-wrapped products, whether it be consignments of goods or packages: The great strength of the push tray sorter is its enormous band width and its ability to sort all current types and sizes of dispatch goods. Even round, very light consignments or irregularly shaped goods e.g. sourced from China pose no problem for the OptiSorter. The key to this is the relatively low speed of 1.1 m/s on the one hand and its unique push tray technology on the other hand – protecting round or light items from falls. At the same time, the horizontal OptiSorter can also handle very heavy items up to 31.5 kg, which further extends its band width. You will be able to sort a wide variety of items, from small to large, light to heavy, whatever their shape or packaging and to do so with just a single line. The versatility of the OptiSorter makes it the ideal solution not just for parcel and packet sorting but also makes it the outstanding choice for all logistical applications in e-commerce, wholesale and retail or warehouse management. The OptiSorter also scores top marks for profitability and work safety. Despite running at a speed of up to 18,000 items per hour, its unique push tray technology ensures a gentle sorting process with a minimum rejection rate. At the same time, its low power consumption and minimal servicing requirements reduce the operating costs of this flexible system. The OptiSorter is not just kind on the wallet, it is also gentle on the ears and nerves of its operators. Even after long periods of operation, the OptiSorter packet and parcel sorter still generates noise levels of less than 70 decibels and BÖWE Sort software allows particularly simple and intuitive control. A further highlight of the OptiSorters starts to save the buyer money right away by cutting out extra costs at the moment of purchase: Our patented integrated scale for measuring weight and volume is fully integrated into the sorter and provides comprehensive data for the downstream processing of every individual item. Instead of expensively incorporating multiple scales into each of the feeders, the OptiSorter allows its customers to kill two birds with one stone. 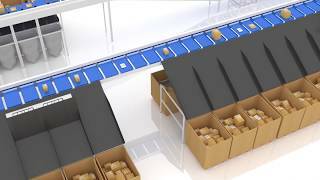 Do you need a space-saving sorting system? If so, then the vertical OptiSorter could be the one for you.